Several years ago, we were in San Francisco on vacation, and found ourselves wandering through the National Cemetery there. I took a picture of a grave, for two reasons. 1) I loved that the stone was carved as a book. 2) What happened to Sophie? 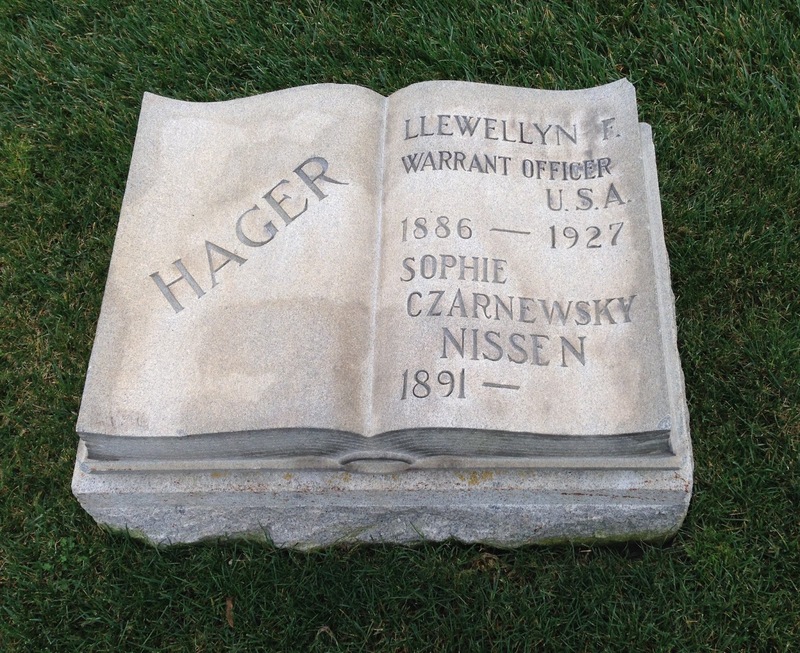 Sophie's husband was Llewellyn F. Hager, a warrant officer, who was born in 1886 and died in 1927 at only 41. But Sophie? Sophie was born in 1891, and NEVER DIED! Was her maiden name Czarnewsky? Or was it Nissen? Or was Nissen her first husband? And if she wasn't buried next to Mr. Hager, did she go on to yet another marriage? She'd have been only 36 when Llewellyn died. I have idly googled her from time to time, and I have turned up NOTHING. My guess is died from natural causes and her family buried her locally. Less useful, and probably something you've already found: https://www.myheritage.com/names/ludwig_nissen. Based on this, my second guess is that she's most likely Ludwig Nissen's daughter. I'm not curious enough to join the site, but I suspect that if you got Ludwig's address and then were able to dig into local church/municipal records, you'd find Sophie. On https://www.ancestry.com/genealogy/records/lewellyn-fernando-hager_4331747, there's a Llewellyn Fernando Hager who married a Sophia-- they may be the same couple as on your gravestone. Sophia is said to have passed away in California, which would line up with the Ludwig connection and Llewellyn's grave being in San Francisco.